Early music is providing some very tempting re-releases. After Erato Originals, which I wrote about a couple of weeks back, comes Archiv's al fresco series. 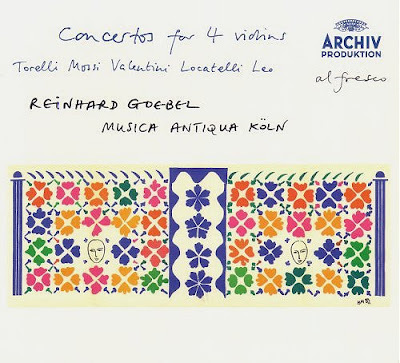 I have been greatly enjoying the collection of concertos for four violins seen above from Reinhard Goebel directing Musica Antiqua Köln from 1992. Musica Antiqua Köln's sparkling playing of five gossamer light concerti by Torelli, Mossi, Valentini, Locatelli and Leo is matched by a wonderfully natural soundbalance. Worth buying for the Fuga: Allegro Moderato of the Leo concerto alone. Goebels enforced retirement in 2006, caused by a neuroligical disorder affecting his right hand, was a grievous blow to classical music. Archiv's al fresco series comes in attractive cardboard packaging with stylish artwork, although at mid-price they are less of a bargain than Erato Originals. But one major moan. The Archiv's al fresco fold-out sleeve contains a brief excerpt from the original sleeve notes, surrounded by a lot of white space. But there is space to list two executive producers and a project manager, in addition to the usual recording producer and engineer. If you want to know more about the music (what do you know about Giovanni Mossi?) you have to go online, click on texts and enter a password (which is archiv60) to read the full notes. It's all geared to downloads; then Univeral Music and other major labels wonder why people don't buy CDs anymore. What a contrast to the independent success story of Alia Vox, who specialise in adding value to the CD format, rather than taking it away. Now, how about a reissue series of new music? Meanwhile, more from Reinhard Goebel and Musica Antiqua Köln here. Q - What is the collective term for two executive producers, a project manager, a recording producer and an engineer? A - A record industry awards table. A reader has queried the attribution of the artwork on this CD.